I was reluctant to leave Seward and the Kenai Fjords, it was so beautiful there an I could have spent days hiking and kayaking around the seashore. At this point I was beginning to remark that there was lots to see in Alaska and perhaps my time was more limited then I originally thought. I drove north of the coast heading into the Chugach forest camping at the Granite Creek Campground where I was nearly alone. Granite Creek was a peaceful little spot nestled in the mountains. After a good rest at Granite Creek I passed back through Anchorage heading north to Denali National Park. This was a good drive at roughly 385 kilometres through mostly small town Alaska and wilderness. When I finally caught sight of Mount Mckinley, the highest mountain peak in North America, with a summit elevation of 20,237 feet (6,168 m) above sea level, I was pretty amazed and in awe of what I was seeing At 18,000 feet (5,500 m), the base-to-peak rise is considered the largest of any mountain situated entirely above sea level. Mount Mckinley was quite a sight, and only briefly did I see the mountain without a full head of cloud around the peak. I found my way into the National Park late in the afternoon and secured a campsite at the Savage River Campsite within the park boundary. Much of the park is off limits to drivers and a bus service is mandatory for much of the main road which cuts through the park from east to west. For campers and trekkers, camping is available all throughout the park or from wherever you can walk to. Of course you are sharing the tundra with Grizzly bears so caution is advised. 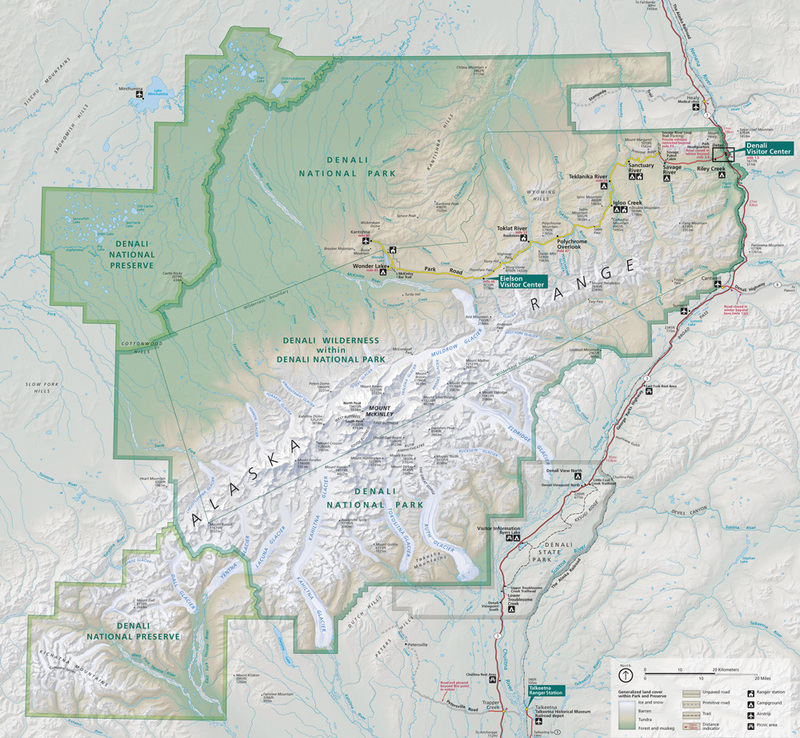 “Denali NP map NPS” by National Park Service – http://www.nps.gov/dena/planyourvisit/upload/1000parkmap.jpg. Licensed under Public domain via Wikimedia Commons. I had a great rest at Savage River after climbing a random peak and getting some amazing views of the valleys below. In the morning I hopped onto a bus which took me into the park as far as Toklat River. I was hoping to make it all the way to Wonder Lake, the deepest place one can take a bus into the park, but that particular spot was only opening the following week. The bus tour was pretty nice, the driver gave us lots of information about the park and geographical features and we were able to get off and look around every hour or so. We were also welcome to get off the bus and hike across the tundra on request. I decided to stay with the tour and get as far into the park as possible. On route we saw a number of arctic ground squirrels, moose, caribou and grizzly bears. Of all animals I was of course most interested to see the grizzly bear in its natural habitat. We had three different grizzly sightings: the first was a lone grizzly from a dozen kilometres away, only visible by binoculars; the second was a hundred yards or so away, a family of grizzlies, and the final was a large male from only a few dozen yards away. The final sighting was really special, a large make grizzly walking alone along the riverbed, he stopped to rest in the sun before proceeding towards the creek which still ran through the riverbed, much to our thrill he draws closer to us as he approaches the riverbed. We are on a lookout above the riverbed looking down upon the grazing grizzly. The grizzly approaches the water, wades in, and then lays down with his head facing the oncoming current of the river. He floats here for a while, getting pushed downstream, with his mouth open, catching fish or a drink. Once refreshed he continues through the river, parading right in front of our lookout and continues along the riverbed. It was such a thrill not only seeing a grizzly up close, but also seeing a grizzly truly enjoying his freedom and being natural in nature. Denali north: Alaska Trip by Michael Paskevicius is licensed under a Creative Commons Attribution 4.0 International License.